Sarah C's Rambings: How's This For Speed? 1) Alter a food container into something useful. Could be a coffee jar, tin, take away carton, pizza box -anything which you can recycle into something useful, but its original purpose must have been to hold food. Extra points were given if we included hand doodling. Here's mine. I used a tub that had cheese footballs in that you get at Christmas. I covered the outside with pearlised lilac paper and lined the top of the lid the same. I die-cut the words, outlined them with purple pen and added chipboard flowers using hand doodling to join them all. On the top, I put a purple flower and brad I'd been sent by one of my 3C buddies when we did a secret stash swap last year. I loved it so much I didn't want to part with it, so using it like this means I get to keep it! 2) Well it had to be a Valentines card didn't it? I know some of you have already made one, but make him another - you know he's worth it!! The card must include the word 'love' and must have at least one heart on it. Extra points were given for using real stitching (hand or machine stitching) and for including a bird. 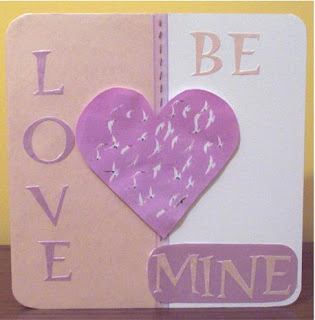 On mine I used pink pearlised paper, lilac ribbon with purple hand stitching, Google image of birds in the shape of a heart and die-cut lettering. Oh My....how cute is this!!! Too much talent for one stamper!!! 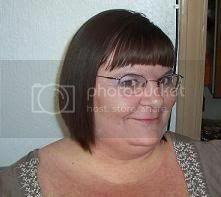 Hi Sarah this is my first time in blog land and thought I'd visit you because we chat on the 3C's.